« 32GB USB Flash Drive On Sale! About 2 weeks ago, I received a surprise email from the consultant of Malay Mail Newspaper, asking for my consent to get featured on their BlogSpot section. 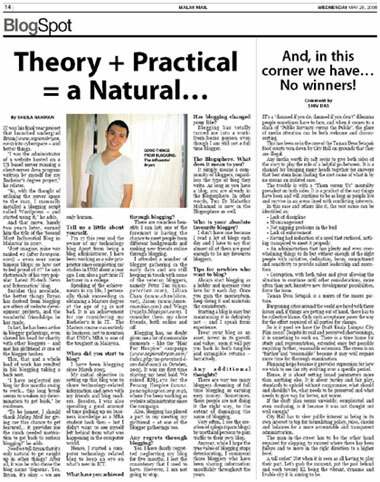 They have been featuring a number of famous bloggers in Malaysia for the past weeks and finally my interview was published 2 days ago on Wednesday, May 28, 2008. 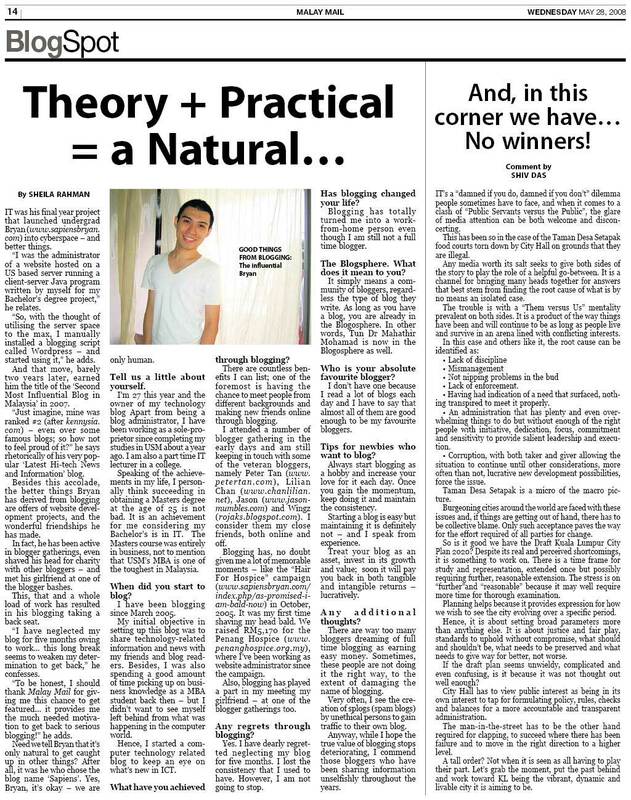 I only received the snapshot of article today, hence, this late post. This interview marks my return to blogging after 5 months of long break, which I dearly regretted as mentioned in the interview. I owe so much to the users of my WordPress Theme – Adsminded and the blog readers too for the lack of blog update. A major update of Adsminded will be released in June and I will set up a forum dedicated for it as well. You will definitely see me posting again very soon, till then see ya! Congrats on being featured in Malay Mail. Now more femes liao. Now The Stars is also featuring femes blogger. Like that also can ar??? Not fair. I blog more than you. LOL. Bravo dude! Proud of you!! So, feel inspire again and gonna contribute more to your blog? Write more and share more. Hope that will have another newspaper contact you for interview. Wuah must ask for autographed copy. Now I just remember that I haven’t even seen my own interview. Congratulations. Don’t know when my day will come when someone actually wants to interview me. Che-Cheh : Thanks. I’m so glad I’m not totally forgotten. skyfish : You also don’t give up blogging ok. Cheers! Lilian :I asked it from Sheila since we can’t get it here in Penang mah. Nigel : Just keep blogging, hopefully it’ll bring something to you too. Yeah,welcome back Bryan….i m 1 of ur “blog fan”..haha…has been a long long time oredy tat no latest post on ur blog…beside,wat u hav posted is very very useful,nt oni 2 me but i think to others oso…#2 Most Influential Blog In Malaysia,u deserved it Bryan…Add oil!!!! waiting ur latest post,cya.. Thanks for the encouraging words, Peter! bro, u botak like Peter adi? #1 and #2 very alike. i think if i wanna be #3, have to follow suit.